Contouring can be intimidating. Not to mention, we don’t always want to look like a Kardashian on the red carpet. Sometimes we simply want a more natural, sculpted look. If you’re looking to get a [subtly] more sculpted face, one of the best things you can learn is how to contour your nose. It’s easy to go overboard when you contour your nose, making it look like a brown blob. So if you want to know the best contouring tips to sculpt your nose in the most natural way, keep reading! You’ll want to start the nose contouring process by highlighting the centre of your nose with a luminous concealer like this NARS Radiant Creamy Concealer. Make sure not to use a shimmery highlighter for this step to avoid looking shiny. Use a concealer that’s one or two shades lighter than your natural skin tone. Start at the bridge and apply the concealer down your nose, stopping before you reach the end. It’s easy to give your nose a little upturn while you’re contouring it. Once you’ve highlighted down the centre of your nose with the luminous concealer, add a little dot at the very tip of your nose. This will give it a slight lift! Don’t worry, you’re not going to leave the stripe of highlighter on your nose. Now you’ll want to blend and soften the stripe using a Beauty Blender or your finger. Start by pressing the concealer into your skin, then lightly rub the edges to eliminate any harsh lines. Use a sculpting powder or cream to shade the sides of your nose. Start from the inner corner of your eye and shade straight down to the end of your nose. Do this for both sides and fully blend before adding or removing any pigment. This palette features eight pigmented creams for highlighting and contouring. They’ll help you add depth and definition to your look with creamy-soft textures and colours. We talked about using a luminous concealer for highlighting above, and as I mentioned, this one by NARS is a great option! Made with a botanical blend and light-diffusing technology, it’s the ideal luminous concealer for contouring your nose. This amazing palette has three shades for contouring and three shades for highlighting. It’s a 24-hour wear formula that features high pigment, creme contour products. The velvety, non-greasy shades melt effortlessly into the skin and are ideal for both dry and oily skin types. Use a contouring or sculpting brush to apply this powder wherever you need it most! It offers sheer to complete coverage to enhance, deepen and sculpt the face. Not every nose is the same. If you’re wondering “How do I contour for my nose shape?” we’ve got you covered with these 7 tips for every nose shape! If the bridge of your nose appears flat or undefined, you probably have a flat nose. To give it more definition, contour in two straight lines on either side of the bridge. This will give the illusion of a more sculpted bone structure. Triangle-shaped noses are wider at the nostrils and thinner at the top. Balance out your nose by contouring the tip of your nose and applying highlighter under the inner corner of your eyebrows. If you have a crooked nose (a nose that appears uneven or slightly slanted rather than following a straight line), contour a straight line on both sides of the bridge and apply highlighter in the middle. Bulbous noses have a thin bridge and wide set nostrils. In this case, you can contour the top and bottom of your nose and apply highlighter to the centre of the bridge. If you have a small indentation on one of the sides of your nose bridge, you probably have what’s referred to as an irregular nose. Apply highlighter to the indented area to combat any shadows. Heavy noses feature a heavy brow that creates a shadow over the bridge of the nose. To brighten and lift this area, apply highlighter in an upside down triangle shape between your eyebrows. If you have a narrow nose, you may actually want your nose to appear a bit thicker. You can do this with contouring! Highlight in two straight lines on either side of the bridge of your nose to add thickness to the bridge! Watch as Bella Fiori transforms her nose beautifully with this contouring tutorial. Her favourite products to contour her nose include TheBalm Bahama Mama Bronzer and the Hourglass Ambient Lighting Palette. Use her tips and you’re sure to create a perfectly contoured nose! This quick and easy tutorial explains how to contour your nose in under five minutes, meaning it’s a look you can conquer every day if you want to. She uses Tom Ford Shade and Illuminate in Intensity One, the Benefit Bronzing Powder in Hoola, among other awesome products to create the look! Check out some of the top nose contouring tricks with this tutorial! Using products such as the Wet N Wild Highlighting Gold Bar in Holly Gold Head and the Urban Decay Naked Skin Shape Shifter, you can easily transform your nose into your ideal shape! Contouring your nose can help beautifully transform your face! If you’re looking to perfect nose contouring, use these tips and tutorials to master the art of contouring your nose! 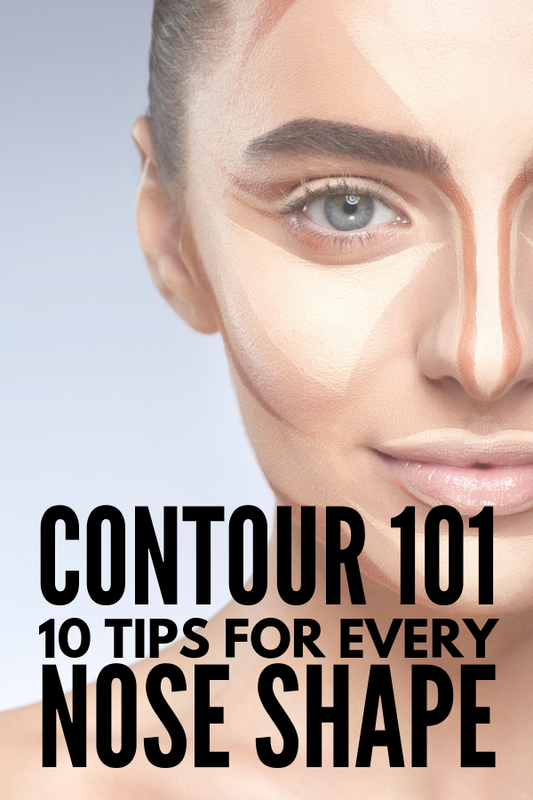 If you loved this post on how to contour your nose, please share it on Pinterest! And if you want more contouring tips and tricks, we’d love if you follow our Beauty Board on Pinterest!